We mourn the passing of Austin H. Kiplinger, Chairman Emeritus, on November 20, 2015, at age 97. Published in the 2011 WIHS Program. This was during the great drought years of the 30s and the Depression years. I was in my teens and my father was an editor here in Washington. He thought I ought to get out of Washington and get some experience and learn what goes on in the rest of the country. He talked to some of his banker friends, one of whom was in Kansas. He asked what he ought to do with his son, and he said to send me out to Mr. Graham’s ranch in Oklahoma. He was a veterinarian and raises Hereford cattle. Maybe your son could learn something about the world. So he did. I went out and lived with the family on the ranch. It was about 20 minutes from Tonka City, in Caw. I worked and did farm work, and I rode for cattle work. We had to drive the cattle to watering ponds because there was no rain. We had to drive them a number of miles to get them to water. I did that work for two summers. I became interested in that sort of thing and in horses. I didn’t ride again for many years after that. When I went to the country later on, I bought a farm here in Maryland. I was talking to a neighbor and he said, ‘Have you ever tried foxhunting?’ and I said no, I hadn’t ever jumped a horse very much, maybe over a couple of logs. He said I should go cubbing in the early weeks of the hunting season and you train your hounds. He said it was kind of like a ride in the park. That was his description. I said sure and we went out. He gave me a horse that had been a whip’s horse out in Rappahannock. He was a very experienced and steady horse. All of a sudden, the hounds got onto a fox and were off. We were running at full tilt, and I was presented with a fence! All of a sudden, I found that this horse knew what to do. He jumped it, and that was my first experience with jumping. I survived that day and I was hooked. Austin Kiplinger in the hunt field, 1979. 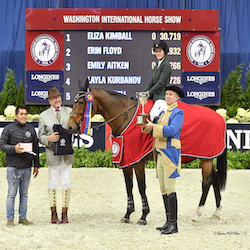 Was it through foxhunting that you became involved in the Washington International Horse Show? 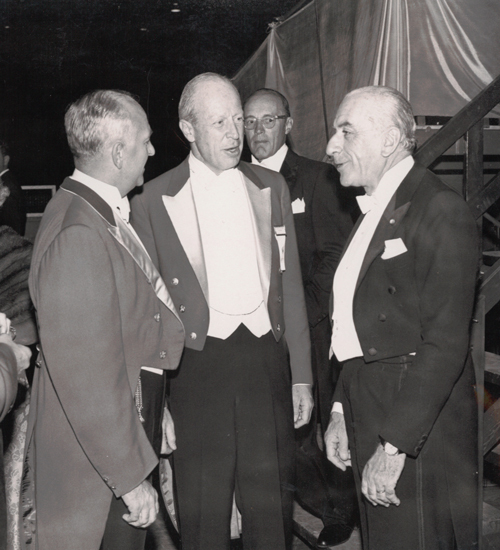 I got a call one day from a friend named Claude Olin, who was interested in the WIHS. 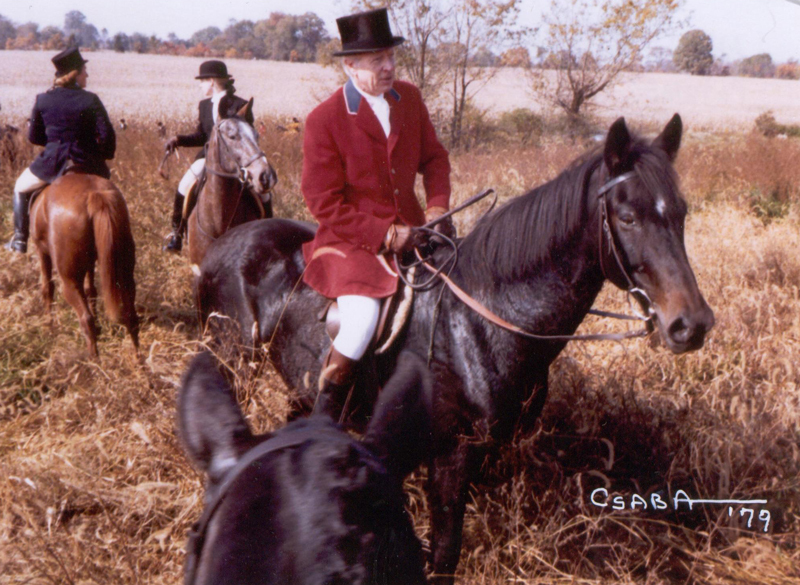 He was a former Master of the Foxhounds of the Potomac hunt. He didn’t tell me what he wanted to talk about. This was in 1965. We had lunch at The Jockey Club, which was a very famous restaurant. Two other people were there; one was the vice-president of the WIHS, a man named Colonel Rene Studler. The other was Georgine Winslet, who was the Executive Director of the show. They said, ‘We want you to be President of the WIHS.’ I said, ‘Oh, I can’t do that! I don’t know anything about horse shows.’ But, I did say I would go on the board, which I did. Two years later, I was asked to be President and I served a term from 67 to 70, and I’ve been on the board ever since. What do you know about the WIHS’s early history? The horse show started in 1958. Then it had a year off; there was a hiatus in 1964 when the show didn’t work because it was an Olympic year. The Olympics were in Japan, so all of the top jumpers were out of the country or had been. They were too tired to come to Washington, so they just canceled the show. I came on the board in 65 and we resumed the show. It’s been going steadily ever since. We used to get White House involvement. The First Lady has always been an honorary chairman, from the very beginning, without exception. Some of them were horse people and some of them were not. Jackie Kennedy, of course, was very much interested. Her horse competed in the show with Eve Fout, her friend in Middleburg, VA. Some of the presidents have horse interest, of course. Ronald Reagan did. 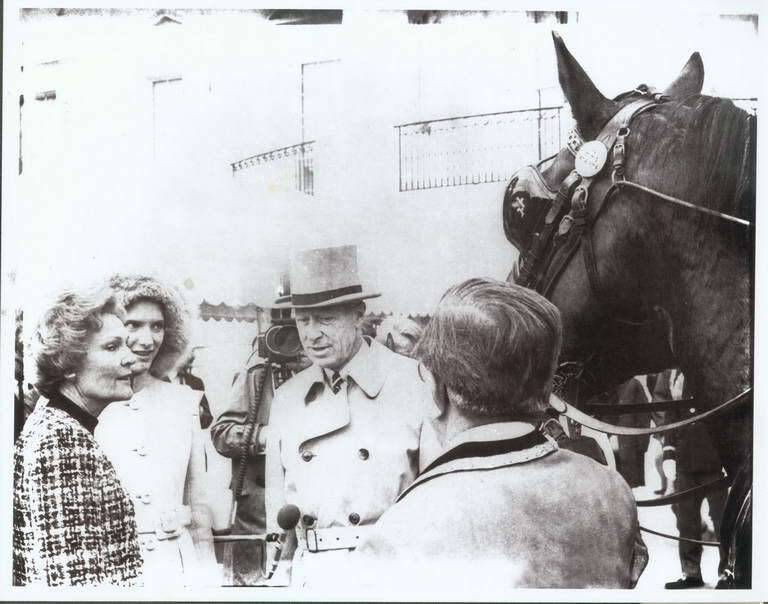 On the other hand, some of the First Ladies were very unhorsey, (like) Mrs. Nixon. We took carriages to the White House. Our friend Fairclough from Delaware and Pennsylvania brought carriages down. We drove them down Pennsylvania Avenue- a four horse team. We went to the White House in 1962. We took Mrs. Nixon for a ride around her own park! 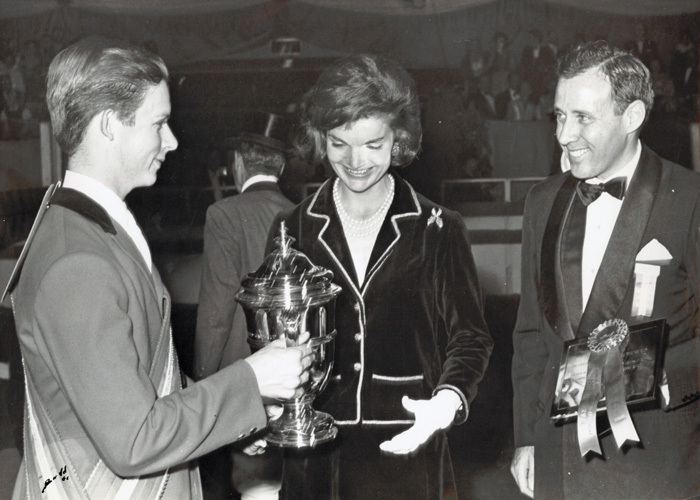 First Lady Jacqueline Kennedy presenting the President of the United States Perpetual Cup, 1961. In those days, of course, you could do that. I remember in 1976 when we were celebrating the 200th anniversary of the Declaration of Independence and we had a lot of horses involved in the Fourth of July parade down Pennsylvania Avenue. I rode in that with the Potomac Hunt. Things have changed so much. Traffic has gotten so heavy and security concerns are so great that those things don’t happen anymore. You can’t get within two blocks of the White House with a vehicle anymore. But, we used to just take horses right up to the White House, through the gate, and around the South Lawn, so that’s something that’s changed and occurred in the last 45 or 50 years. During the life of this show, that’s an interesting comparison that I hadn’t thought of. Fifty years ago, you could take horses up to the White House and now you can’t. Austin Kiplinger at the White House to give The First Lady a carriage ride. Were a lot of early government officials and cavalry/army people drawn to the WIHS? Yes, that’s another change over the past 50 years. All fo the diplomats had cavalry experience in the years gone by. We used to have a diplomat class and diplomats would compete at the WIHS. These were ambassadors from Argentina, Spain, France, Germany, England, almost everywhere. They had either ridden as a sport or had been in the cavalry. If they had just been officers in any military unit, they rode. That was the norm until fairly recently. I remember going up to the Italian embassy to visit their ambassador. He was a wonderful man and a fine rider. He used to go out riding in Rock Creek Park every day. We went to a party at his embassy once and we got their early. We greeted him coming in from his ride. He put his saddle over his arm. That was fairly normal in those years. Austlin Kiplinger with the Italian Ambassador at WIHS. 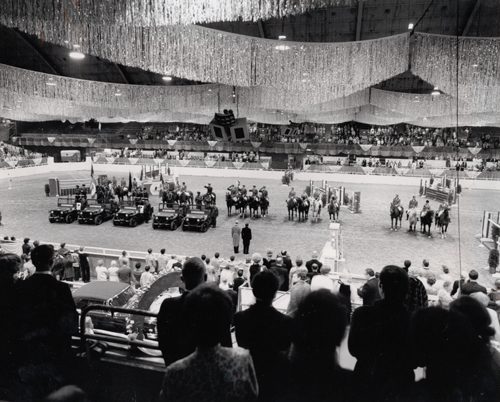 What were some of the reasons in changing venues for the WIHS? It was a necessity because the Armory was beside the site of the new Metro system back in the 60s and early 70s. Two things happened: One, they were building a subway stop right next to the Armory. The construction equipment was all over the place. The second was that they took our parking lot for construction equipment. We didn’t have any place to put the stalls. We were just evicted in a sense and had to go someplace. We went to the US Air arena by the Beltway in Maryland. Then they decided to tear down that thing, so we had to go somewhere else and we came back downtown to Verizon Center. WIHS at the National Guard Armory in Washington, D.C.
Now the WIHS is at Verizon Center- what do you think is special about that venue? We have the video jumbotron overhead so that you can watch the jumping from overhead. It gives you a very good close-up on a lot of the competition. You can like it or dislike it, but the younger audiences like it. We can communicate with our audience; give them background on the event, and we can talk about the rules, educate the audience to a greater degree than we used to. It’s necessary now because a lot of the audience is not as knowledgeable. We now have the facilities to do that. In modern terminology, that is an advance. Some of us liked it the old way, but for the audience it is. It gives them a better opportunity to follow the event closely and be more involved. What do you think has stayed the same at the WIHS? The traditions of horse competition are pretty deeply rooted. If you want to get philosophical and historic about it, horses and mankind have been related for thousands of years. Until about two or three generations ago, the horse was the main source of power and transportation for the human race. The association of man and horse is very, very deep in our history as a civilization. Well, there was Zsa Zsa Gabor! She rode in the show. She rode a horse, but didn’t jump. We had her as a celebrity guest. She just rode for fun. We’ve had a lot of celebrity guests. On a more serious note, we had Christopher Reeve a few years ago. We would have had President Reagan, except the Secret Service wouldn’t let him come. They’re very careful about Presidents. What effect do you think the horse show has on the local community in Washington D.C.? I wish it had more effect. I think that the interest in horses- the larger a city becomes, the more distant the horse becomes. Generally speaking, I think the great metropolitan areas are losing their understanding of agriculture, farm life, and animal life. I think it’s an education for the children. We try to bring schoolchildren in, and we do bring a lot of them in as guests to show them what life was like in years gone by and also where their food comes from, from farms and agriculture. Horses and agriculture are like hand in glove until just a few years ago. I think children get a real sense of life as it is, the elements of life. I think therapeutic riding is another wonderful new thing on the horizon. We are benefiting the Autism Speaks this year, and therapeutic riding is a very important part of that exercise. What’s your favorite part about the show, past or present? My favorite part is when it’s over and successfully completed! It’s hard to single out any one thing. The beautiful animals that we get are amazing. I think the quality of the horses is the thing that is most inspiring. We have quality of horses now and an upgrading of the sport at every level, and that’s what gives me greatest satisfaction. I hope that we can keep it going in the center of the city and give city people a look at life between mankind and their animal friends. Recently, in the past ten years, the world’s population has crossed over so that more than half of the people in the world today live in a metropolitan area. Up until ten years ago, you could say that more people lived in the country and small towns. That pendulum has swung and that’s worldwide. People are becoming cityfolk and urban. I think that horse shows and horse sport remind people of their affiliation with the animal world. I think that’s very, very important for us to have a balanced view of life. That is one of the missions that horse shows have, to remind people of their connection with the natural world.